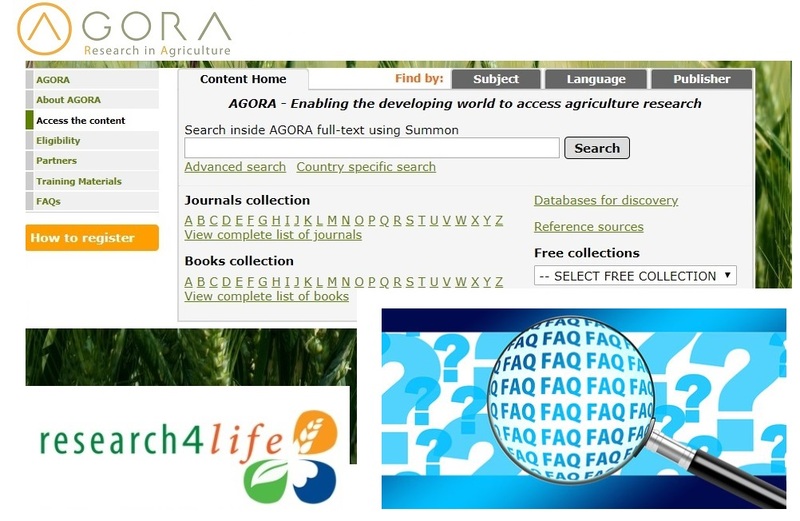 On 3, 4 and 5 December 2018, the AGORA Team at FAO of the UN organised a series of webinars for the 2018 AGORA Alumni of the online course Fundamentals of Information Literacy and Access to Global Online Research in Agriculture - AGORA. The webinar aimed at sharing experiences on the use of the AGORA platform after the AGORA e-course and helping solve any problems or reply to any questions the users might have. During each webinar session, two facilitators of the AGORA Team were available to answer questions. In order to share the exchanges with the wider AGORA and Research4Life community, the questions and answers provided during the three webinars were summarized and translated. Interested to know what were the Frequently Asked Questions (FAQ) in the sessions? You can read an overview of the discussions and questions asked during the December AGORA Alumni Webinar Series in English, French and Spanish, below. 1. How can I know if the institution I work with is registered for Research4Life (R4L) or not? 2. What are the steps to register an institution and how long does the process take? Once you have submitted the form, it will take around 2 weeks to complete the registration The director or responsible person from your institution will receive an email with a user’s agreement. Once finalized, a username and password will be shared with the contact persons listed in the registration form. 3. Can I register as an individual? 4. What do I do if I don't have access to the username and password to enter R4L? 5. How can we best manage the use of the username and password within our institution? 6. How can I activate IP recognition in my institution? First ask your IT focal point to register the IP of the institution in the IPRegistry (theipregistry.org). If you do not know what the IP of the institution is, you can check it from a computer on the institutional network using the following website whatismyip.com. Registering in the IPRegistry is a necessary validation step before R4L can register the IP. Once registered in the IPRegistry, send your request for IP registration to r4l@research4life.org and you will receive a notification when the process is completed. 7. I don't know the programme GOALI. What is it about? 1. What are the topics covered in AGORA? AGORA is the R4L programme that focuses on all aspects of agriculture in a large scale. This includes: food, agriculture, aquaculture, environmental science and related social sciences. 2. Can I find agricultural statistics in AGORA? 3. Why do I not have access to the full-text of an article? You can check if you are connected on the top right hand side of the portal where it says Logged in from: name institution/country. This can happen when you use the generic Summon search. The results of the generic Summon will include references to all documents in Research4Life, including the ones excluded in your country. 3.3. The link between the portal and the website of the publisher has changed or is broken. In this case please write to agora@fao.org to report the error. Include as much detail on your search as possible as well as screen shots. 1. What is the difference between Summon and a Country Specific Summon? The generic Summon search bar, that you will find on the main page of the AGORA content portal, searches the entire Research4Life database for references corresponding to your keywords. It does not take into account the limitations of the publications available to your institution and country. Using Country Specific Summon will only give results that give access to the full-text of the articles. It takes into account the exclusions. 2. Why does my country not appear on the list of Country Specific Summon? What should I do? The R4L team is currently working to develop Country Specific Summon solutions for all countries, which will be available soon. Other countries will be developed during 2019. In case your country does not appear on the list, you can use the generic Summon on the main page of the AGORA content platform. Don’t forget that this may be the cause why not all results give access to full-texts. 3. Why do I do not have access to full-text articles using Summon? This can happen when you use the generic Summon search. The results of the generic Summon will include references to all documents in R4L, including the ones excluded in your country. It is also possible that the link between the portal and the website of the publisher has changed or is broken. In this case please write to agora@fao.org to report the error. Include as much detail on your search as possible as well as screen shots. 1. How can I be informed about upcoming trainings or webinars? 2. How can I enroll for the next edition of the AGORA Online Course? The course will also be organized in French and Spanish. 3. Are the online courses certified? Yes, at the end of the online course you can download a certificate of attendance if you obtain a minimum score of 60 percent in the final exam. 4. Where can I find more information on reference management tools such as Zotero and Mendeley? 5. Can I request for a face-to-face training or a specific training for my University? AGORA strives to organize as many Massive Open Online Courses (MOOCs) as possible to reach a wide audience and allow as many users as possible to benefit from the training. You can enroll a group of interested people of your institution and take the course together. When you enroll as a group each person needs to register individually. If you inform us on agora@fao.org, we would be happy to know who took the initiative and which group is participating.